Often, in our travels around the world (or neighborhood), there are events or trips that we go on where they advertise "free childcare!" - it ranges from PTA meetings to the Disney cruise. It's pretty much impossible to take advantage of these pre-arranged child care options for Edda as it's hard to just drop her off with someone who hasn't met Edda before and also has 8-10 other kids to look after. 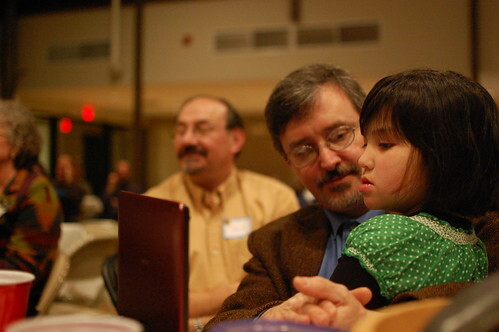 Jeremy and I went to a potluck at church on Saturday night, and of course, there was free childcare. I asked to put Edda on the list, I haven't done this before and normally I would ask Eliana to watch Edda at home on Saturday night, but it was Eliana's birthday and also the church is always, always telling me that they can handle Edda (which I know they want to be able to do).. Anyhoo, we show up and there are like 40 kids packed with very little intersitial space between them and a few adult babysitters who seemed already overwhelmed (only 25 kids had signed up for the child care). I don't want to be like, OMG, they totally weren't prepared for Edda, because everyone was very nice about it all and they were already SO MANY KIDS. So we took Edda with us to dinner and Edda had a nice time. Edda is pretty low maintenance these days at dinner, she'll eat and watch TV and be pretty easy to manage until it creeps close to 8:30ish when she's ready for bed. Vince, of course, had a great time elbow deep with the other kiddos.